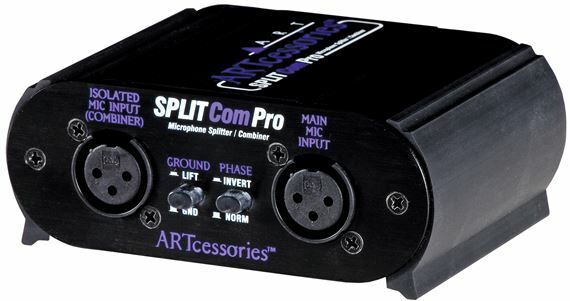 Shop ART Splitcom Pro 2 Way Microphone Splitter and Combiner from AMS and enjoy Fast & Free Shipping. The ART Splitcom Pro can split a single microphone signal into two outputs or combine two microphone signals into one output. It works! I can now run 2 condenser mics into the single input of my effects pedal! Metal housing. Seems very well built. I will be using it in a live situation early June so dependability will be tested and proven then. I bought this as a combiner. If you have limited XLR inputs in either your mixer or an effects processor, this will enable you to put 2 mics into 1 input. I bought a TC Hellicon Voice Tone Create just for decent reverbs and a few special effects for specific songs on stage. I am a vocalist and a flutist and did not want to always be anchored to the mic stand but that single input on the TC would not allow me to use the 2 condenser that I have. (Audio Technica ATM710 for vocals and K&K Silver bullet condenser for the flute.) So the TC Hellicon's Phantom Power switch will pass through to the Audio Technica via the MAIN XLR and the Silver Bullets' own pre amp will power itself pre-ART Split/Com. So the ART Split/Com can combine either two dynamic mics, one dynamic and one condenser and even 2 condenser! Plug n Play. Just experiment a little with that phase switch. When I first fired it up, I sounded perfect. Both condensers sounded great and balanced. After playing though it for a week, I finally decided to switch the phase switch and it improved the apparent line level balance between the two mics even more!